Pallasites are the most beautiful form of meteorite jewelry! The mixture of crystalline yellow to green olivine (peridot gem) is naturally embedded in an iron Widmanstätten pattern matrix, which becomes apparent when the meteorite is etched. They are often referred to as "celestial stained glass!" The name "pallasite" came from the name of the German naturalist Peter Simon Pallas, who first took interest in pallasites and described it in his writings, in 1772. This meteorite is called Seymchan. It was found in 1967 in Magadanskaya, Oblast, Russia, near the settlement of Seymchan. Most meteorites are derived from the cores of ancient proto-planets that were destroyed around 4.5 billion years ago by catastrophic impact events during the formation of our early Solar System. 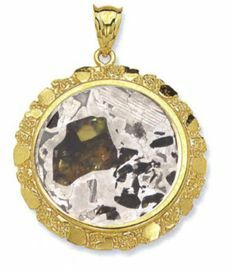 The olivine (peridot gem variety) in pallasites is magnesium-rich and shows signs of "shock" and impact, which occurred in outer space. Many of the olivine gems appear rounded. Some scientists think this is because the olivine was once liquid droplets suspended in a frozen metal matrix. It is considered to be among the most stable of pallasite meteorites. Seymchan belongs to Main Group pallasites, but it is considered anomalous due to its high Ir content. Seymchan is considered a stable and rust-resistant pallasite. This is a fantastic Seymchan pallasite meteorite set in 14K gold in an outstanding design. Beautiful style, color and it contains at least one great green "window" to see through side to side when held up to the light. TWO MADE, BOTH SIMILAR. 4 prong setting. Pendant bezel inside diameter (circle size): 30mm or 1 3/16". "A fantastic meteorite from the cosmos - a beautiful gift from our universe!" Shipped in an attractive jewelry box with detailed information and Certificate of Authenticity. PLEASE ALLOW 2 weeks for delivery from order date. TWO MADE, BOTH SIMILAR. Chain not included but available. Just ask about length and pricing. We will supply a top of the line chain if you are interested.